We have filled the room capacity at the Kimber Festival. We are sorry that we cannot take any more registrations. Located in Philadelphia, PA, the Simeone Foundation Automotive Museum is one of the world’s greatest collections of racing sports cars. Assembled over 50 years by Dr. Frederick Simeone, the Museum contains over 65 historically significant cars including Ferrari, Alfa Romeo, Bugatti, Mercedes, Jaguar, Bentley, Porsche, Aston Martin, Corvette, Ford, and more. 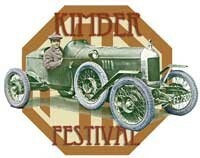 The registration desk for the Kimber Festival will open at 1:00 p.m. Friday at the Simeone Museum. You will be able to take a relaxed tour of the facility during the afternoon. Once checked in at registration, those who wish to set up their Flea Market table will be able to do so. Participants must pre-register for flea market space (check box on the registration form to ensure your space). Due to space reasons, no walk-in flea market tables will be available. There will be a buffet dinner and our "Cecil Kimber Birthday Celebration" during the evening. Seminars will start at the Museum at 9:00 am and continue until 12:00 noon. There will be a break for a buffet lunch and then the seminars will resume at 1:00 pm until about 4:00 pm. After the presentations you'll have a chance to meet other participants and presenters, visit the flea market until our social hour. Our final dinner will be served at 6:00 pm. A cash bar will be available from the end of presentations until the event closes at approximately 9:00 pm. Our feature speaker will be Dr. Fred Simeone and he will discuss his MG K3 and the museum, which is one of the finest of its type in the world. There will be an additional display of MG Race Cars during the event. Details of the other presenters and program will be posted as they are firmed up. We have rooms reserved at the Embassy Suites by Hilton Philadelphia Airport, 9000 Bartram Avenue, Philadelphia, PA 19153. Direct pone -- 215 365 4500. The room costs are discounted for us to $149 per night plus tax. Cut off date for our discounted room rate will be March 12, 2019. (The room comes with a full breakfast menu included.) Use the code "Kimber Festival" to receive the discounted rate. Discounted rates are at the hotels discretion after the cut-off date. John Twist – The MG TD/TF Workshop Manual. Tom Lange – Factory Production Records and MG T Repairs. Carl Meyer – Morris Garages in USA. Fred Simeone - MG K3 The BEST MG Made!